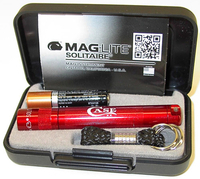 The mag-lite solitaire flashlight is water and shock resistant and includes key ring lanyard. AAA battery and spare bulb. Gift box. 3 1/4" (8.26cm). Made in the USA!